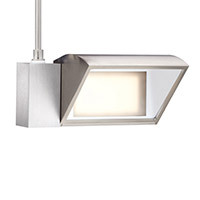 Monorail lighting is one of the most versatile types of ceiling light fixtures out there. The rail's shape can be customized to work with a number of architectural designs and needs including curved hallways, super tall ceilings or gallery-type installations. Flexible track lighting draws attention to important works of art and fascinating structural elements in a space, and the track light heads can be easily switched out should the space undergo a change in theme or purpose. 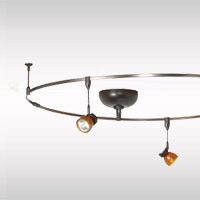 Styles of monorail track lighting systems range from classic to artistic and contemporary, so there's something in this assortment for everyone. There are so many options for adjustable monorail lighting systems that make them perfect for multiple areas of the home or in commercial locations like restuarants, retail stores and more. Ideal in modern kitchens, monorail pendant lights provide warm spotlighting and are often used as kitchen island lighting where a linear suspension isn't the right fit. A monorail light system can also take the place of the chandelier in the dining room, offering accenting light that can complement wall sconces in the room. In the living room, you can highlight works of art with a monorail system and easily adjust its lighting should you decide to redecorate at any point in time. 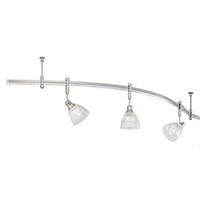 Low voltage monorail track lighting fixtures combine contemporary lighting and functional purpose into one with adjustable monorail heads that make a great addtion to galleries and other commercial spaces. 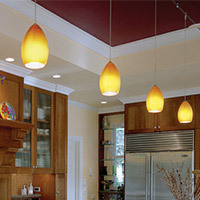 Monorail light systems are designed to be flexible, adjustable and to easily accommodate multiple interior design styles. Unlike a statement-making chandelier or designer pendant light, most monorail fixtures offer their best foot forward from a functional lighting aspect. 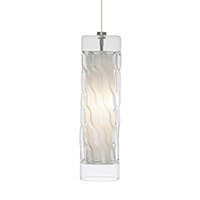 However, modern monorail lighting from WAC Lighting and Tech Lighting exude stylish and noticeable character in any room. And if it is a luxurious look you are trying to achieve, you'll love the crystal monorail pendants from Schonbek. Finally, conserve energy in your space with an eco-friendly, efficient LED monorail lighting system. 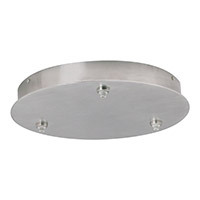 Like most ceiling lighting, monorail systems are offered in a number of different shapes and sizes. Before you find the right monorail light system for your space, you will want to properly measure your ceiling and determine what kind of fixture you will need. 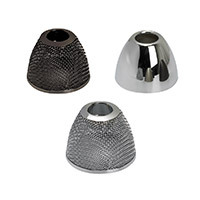 You'll also want to check the dimensions of each fixture, its light source (LED, halogen, xenon, fluorescent or incandescent) and its voltage options. If you have any questions about the monorail lighting featured here, please call our lighting experts at 877.445.4486. To make things easy, you may enjoy a monorail lighting kit. 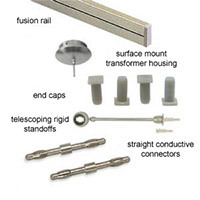 Monorail lighting kits include all of the pieces necessary to set up your own monorail system, making installation a breeze. And look to the complete selection of track lighting for more options including a variety of track heads, track pendants and complete kits. Lastly, consider placing your monorail system on a dimmer to support mood lighting.